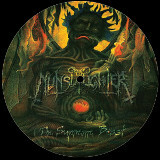 A perennial fixture of the death metal scene, Nunslaughter has made up for the few LPs it has released by the unending stream of splits, EPs, and demos over the past thirty years. A re-release of one of those EPs, 2004's Supreme Beast is even dirtier and lower-fidelity than the LPs, and though it has a ridiculously short play time (only one of the four tracks hits the three-minute mark), it's still a fun listen. I'm pretty sure Hells Headbangers' only update to the album for picture-disk release was to blow the dust off the cover. The dirty and incoherent production, however, has its own charm, sounding like they recorded it in a garage on a cassette tape. Don of the Dead is in good form on this one, croaking the lyrics with gusto, and the riffs range from a slow hammering to pure thrashing, which is quite enjoyable even with the lack of bass bottom end. The title track and Driving Out the Demons are my favorites, but all four songs, including a Black Tusk cover, are pretty consistent in quality. The Supreme Beast is likely to be mostly of interest to fans rather than newcomers to Nunslaughter, who might consider trying their LPs first before delving into the more demo-quality tracks like these.